Coach Anthony with some South Olive Future Stars! $80 per month (2 practices/wk). 10 and Under Tennis: Teaches kids 10 and under a fun new way to learn tennis, with smaller courts, lighter and lower bouncing balls, and smaller and lighter racquets to fit your childs size. It makes it easy and fun for them to hit, play and have fun from the start. Ready-To-Play Tennis: For beginners who want to quickly play tennis and not drill, I will focus on introducing the basic functions to hit, play and keep score in a quick start tennis format. If you are a beginner and would like to learn the game of tennis or someone who wants to improve your game, please give me the opportunity to teach you the game of tennis. I am also available for players who simply need a hitting partner. Instruction is structured and based on your objectives. For intermediate and advanced players, I can work with you to improve your stroke production, footwork, shot selection, agility, and strategies and tactics to improve your game. JUNIOR TENNIS - SIZED JUST RIGHT FOR KIDS!! USTA 10 AND UNDER TENNIS is at SOUTH OLIVE! 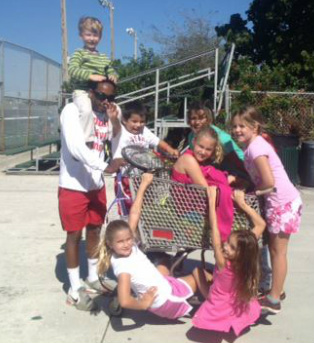 Click here for more details on the USTA Program, 10 and under tennis.